Sections 10 A and 10 B 1. Background: 1. 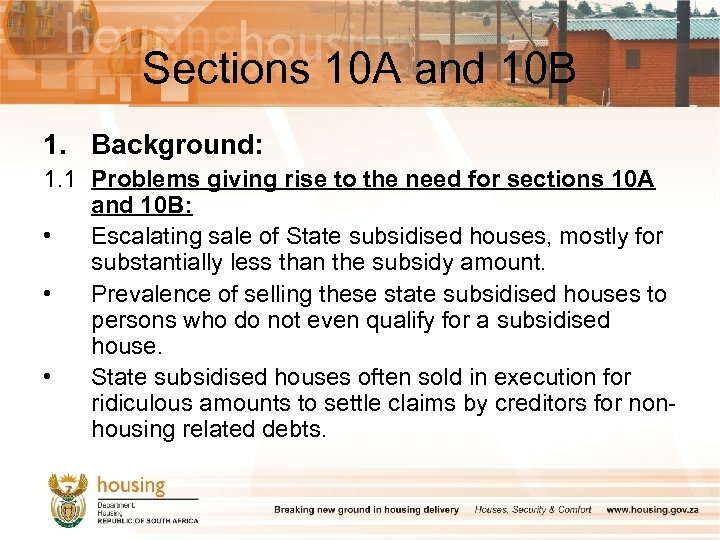 1 Problems giving rise to the need for sections 10 A and 10 B: • Escalating sale of State subsidised houses, mostly for substantially less than the subsidy amount. • Prevalence of selling these state subsidised houses to persons who do not even qualify for a subsidised house. • State subsidised houses often sold in execution for ridiculous amounts to settle claims by creditors for nonhousing related debts. Sections 10 A and 10 B 1. 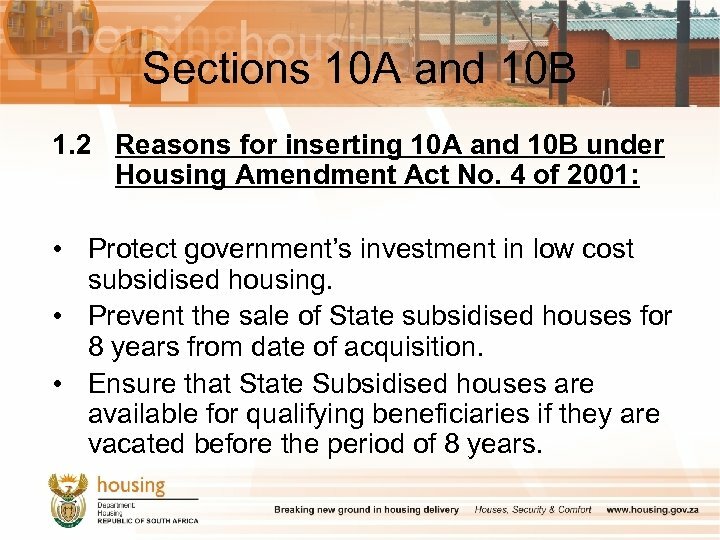 2 Reasons for inserting 10 A and 10 B under Housing Amendment Act No. 4 of 2001: • Protect government’s investment in low cost subsidised housing. • Prevent the sale of State subsidised houses for 8 years from date of acquisition. 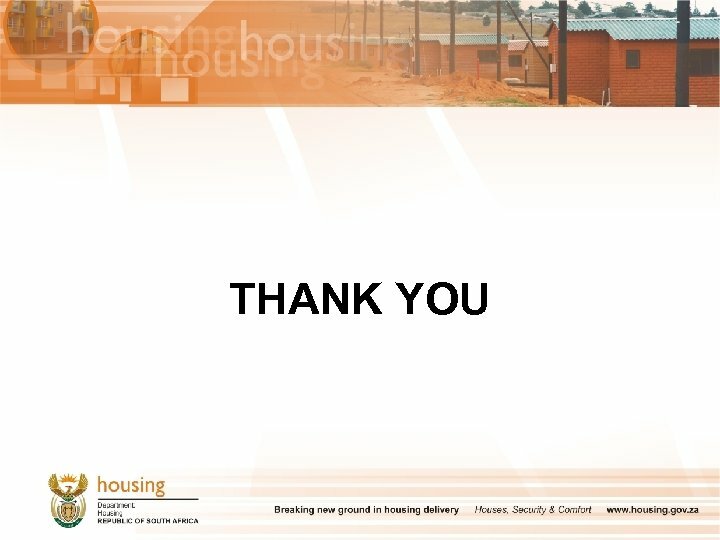 • Ensure that State Subsidised houses are available for qualifying beneficiaries if they are vacated before the period of 8 years. Sections 10 A and 10 B 1. 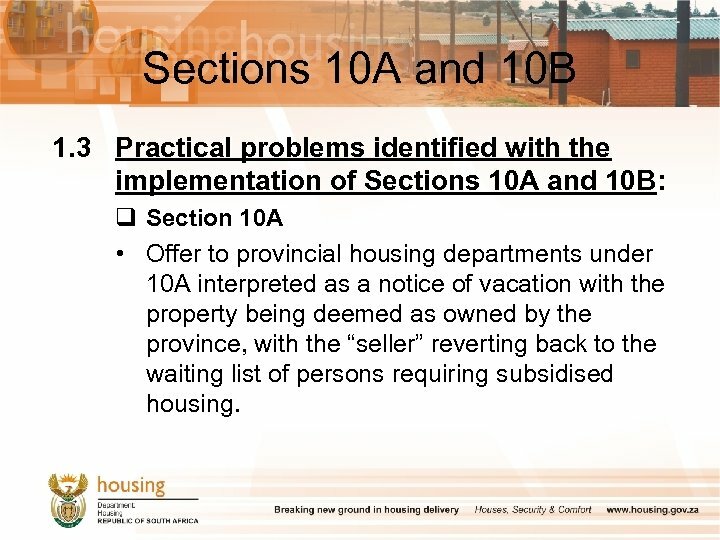 3 Practical problems identified with the implementation of Sections 10 A and 10 B: q Section 10 A • Offer to provincial housing departments under 10 A interpreted as a notice of vacation with the property being deemed as owned by the province, with the “seller” reverting back to the waiting list of persons requiring subsidised housing. 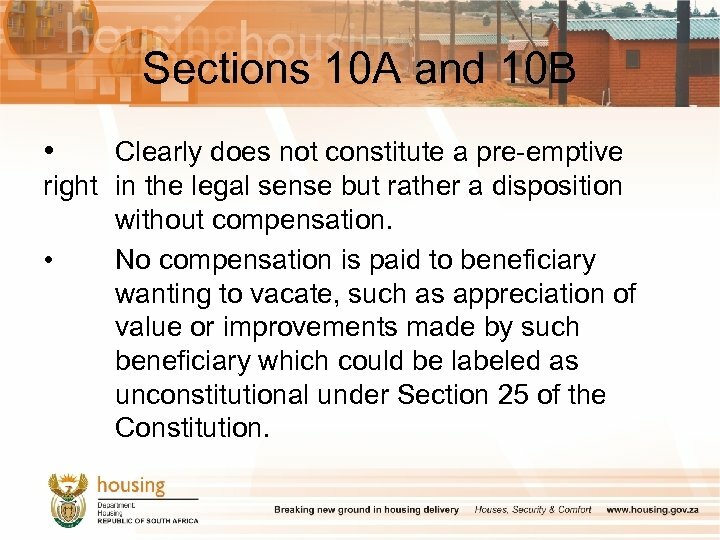 Sections 10 A and 10 B • Clearly does not constitute a pre-emptive right in the legal sense but rather a disposition without compensation. • No compensation is paid to beneficiary wanting to vacate, such as appreciation of value or improvements made by such beneficiary which could be labeled as unconstitutional under Section 25 of the Constitution. 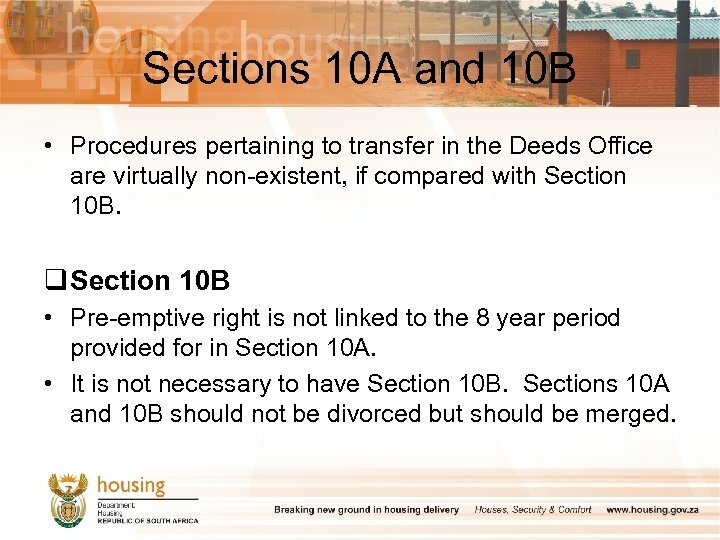 Sections 10 A and 10 B • Procedures pertaining to transfer in the Deeds Office are virtually non-existent, if compared with Section 10 B. q Section 10 B • Pre-emptive right is not linked to the 8 year period provided for in Section 10 A. 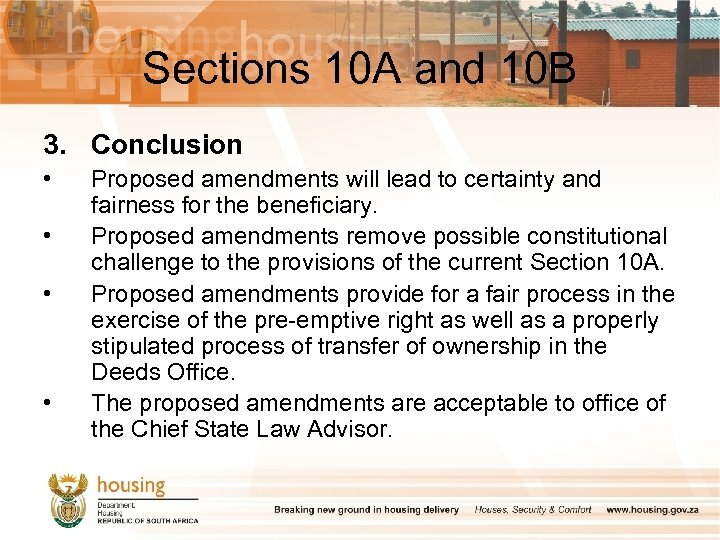 • It is not necessary to have Section 10 B. Sections 10 A and 10 B should not be divorced but should be merged. Sections 10 A and 10 B 2. 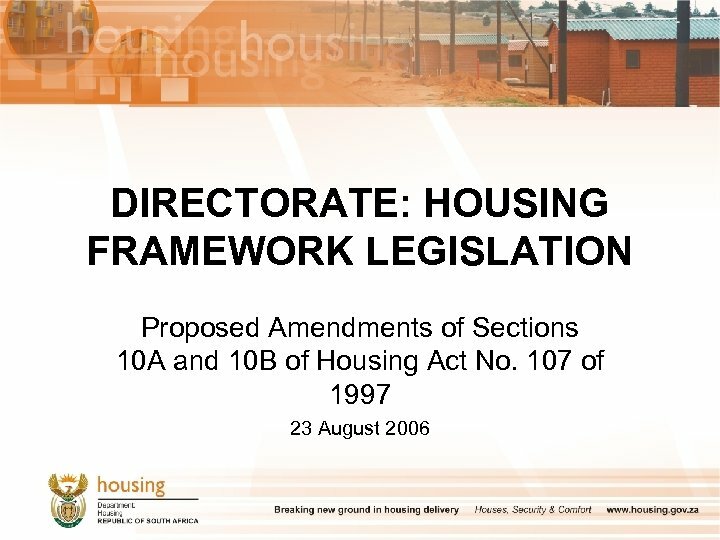 Proposed amendments to Sections 10 A and 10 B under the Housing Amendment Bill, 2006: • • Sections 10 A and 10 B have been merged to from Section 10 A, with Section 10 B being repealed. 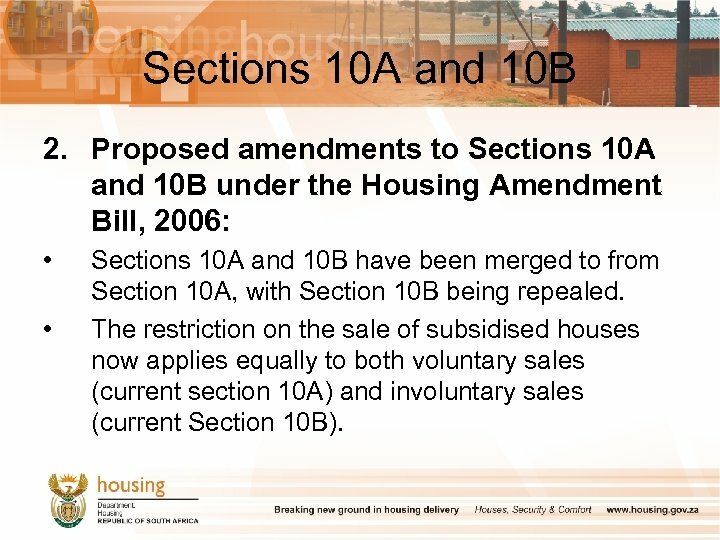 The restriction on the sale of subsidised houses now applies equally to both voluntary sales (current section 10 A) and involuntary sales (current Section 10 B). 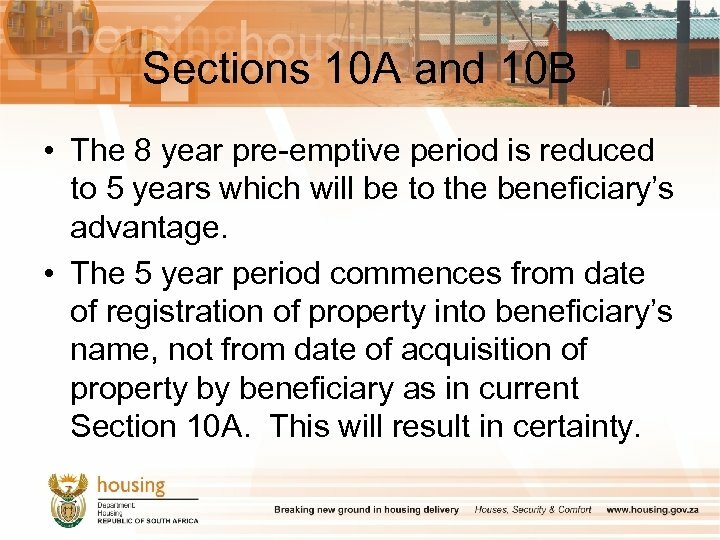 Sections 10 A and 10 B • The 8 year pre-emptive period is reduced to 5 years which will be to the beneficiary’s advantage. • The 5 year period commences from date of registration of property into beneficiary’s name, not from date of acquisition of property by beneficiary as in current Section 10 A. This will result in certainty. 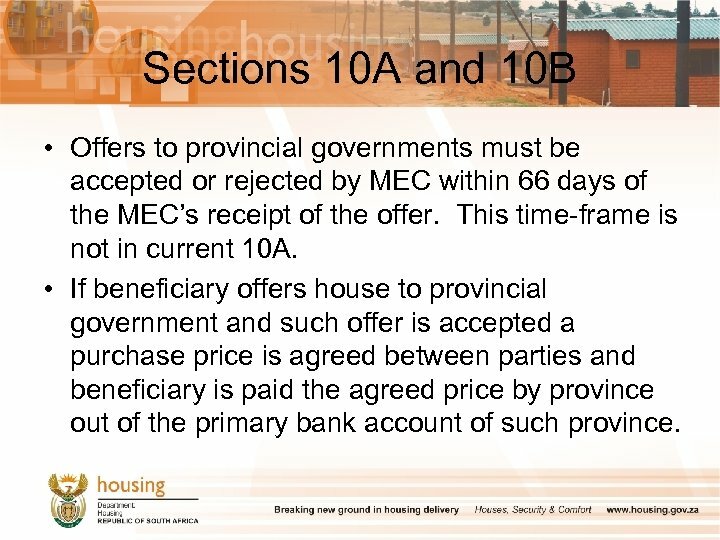 Sections 10 A and 10 B • Offers to provincial governments must be accepted or rejected by MEC within 66 days of the MEC’s receipt of the offer. This time-frame is not in current 10 A. • If beneficiary offers house to provincial government and such offer is accepted a purchase price is agreed between parties and beneficiary is paid the agreed price by province out of the primary bank account of such province. Sections 10 A and 10 B 3. Conclusion • • Proposed amendments will lead to certainty and fairness for the beneficiary. Proposed amendments remove possible constitutional challenge to the provisions of the current Section 10 A. Proposed amendments provide for a fair process in the exercise of the pre-emptive right as well as a properly stipulated process of transfer of ownership in the Deeds Office. The proposed amendments are acceptable to office of the Chief State Law Advisor.